Islands of Nyne developer Define Human Studios has shut down and made its own release free-to-play. The sci-fi take on battle royale was crowdfunded through Kickstarter back in 2016, raising $50,000 before the genre became the hottest trend in gaming. The game eventually hit Steam Early Access back in July. It found some modest early success and placed highly in the Steam Weekly Charts. But after peaking at over 7,200 concurrent players over its launch month, Islands of Nyne hit a rapid decline. 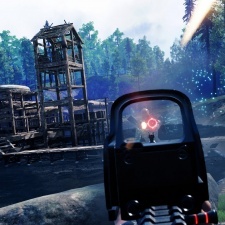 “After much deliberation and with heavy hearts, we have decided to wind down the studio and end live development and updates on Islands of Nyne: Battle Royale,” said the developer in a Steam community post. Define Human has offered to refund all players who bought the game or spent on in-game transactions between November 29th to December 19th. The game will remain online and free to play, and Define Human has offered one final update crediting the game’s supporters. The studio is looking into providing players with server-hosting options in the near-future. But otherwise, it’s the end of the road for yet another battle royale. Another sign that the battle royale boom is extremely selective with who gets the lions share of success.